Manufacturing and Trading of a wide array of Waterproofing Compound, Concrete Plasticizer and many more products. 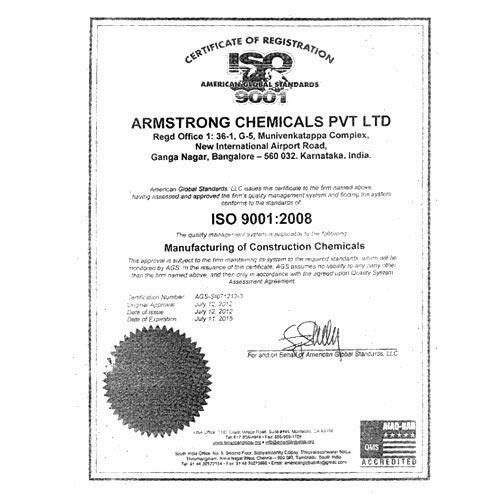 We, an ISO 9001:2008 certified Armstrong Chemicals Pvt. Ltd., established in the year 2011, are one of the leading manufacturers and suppliers of wide range of best quality Waterproofing Compounds and Coatings. Our effective product range consists of Waterproofing Compounds, Concrete Plasticizer Water Reducers and Bonding Agents Adhesives. Offered range is processed from quality assured ingredients that are sourced from trusted vendors of the industry. Processed as per industry laid norms and regulations, these products are valued for their longer pot life, optimum effectiveness and accurate composition. Offered by us at industry leading prices, these Waterproofing Compounds and Coatings are used in various commercial, residential and industrial establishments for efficient waterproofing purposes. Customer centric approach, ability to meet the bulk demands, on-time delivery and transparency in all the business dealings, has helped us in winning the trust of our valuable customers in the most efficient manner. Quality of the offered waterproofing compounds is maintained through rigorous quality assurance tests conducted by our team of quality controllers. Supported by our managing director, Mr. R. P. Rao, we have gained a huge clientele across the nation such as National Academy of Constructions, Jawaharlal Nehru Technical University, L & T Projects and Sanghi Polysters. He with his business ideas, industrial experience and in-depth knowledge, has helped us in attaining a remarkable position in this domain. Air Force Projects of MES etc. Our company has expanded its base of customers by ably serving to their rising demands as well as exceeding their expectations. Reason behind this is our ability of maintaining transparent dealings with clients and assurance to make timely delivery of the consignment. Suryodaya Infra Projects (I) PVT LTD.
P.L. Raju Constructions Pvt Ltd etc. Our company possesses sound and state-of-the-art infrastructural facility, which integrates all required amenities and equipment, through which, we efficiently carry out our whole business operations. Spread across a wide area, we have segmented the entire set-up into several units, which encompass designing, production, quality control, logistics and many others.